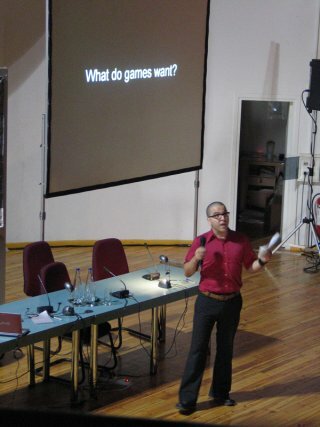 Only now have I found the time to write this wrap up of what was an excellent conference and exhibition in Athens: Gaming Realities, the name given to this year's Mediaterra festival. The exhibition itself gave a solid representation of the artistic game development scene, and was housed in an old gas-works building, converted some years ago into a venue. The conference programme was full (almost crammed) with back to back papers and presentations, starting at 10am and riding through till the early evening. Read on for coverage of what I thought were the highlights. I was especially impressed by Devin and Jamie's Puppet Show: Intuitive Puppet Interfaces for Expressive Character Control where they presented a vision system they had developed (in Processing) to enable control of a virtual puppet using no more than a piece of card folded into a 'glove' covering the fingertips. This made many VR glove interfaces look like sheer overkill and emphasised the extent to which even the most basic gestures can enrich suture with a character. Sadly I can't find a link to this project. If anyone has one, send it through. The Ludic Society's dense treatise looked at a series of interventionist, conceptual and situational strategies (in the form of projects) for repositioning 'real life' in the context of play; as a way of tactically reclaiming freedom of action with ends seemingly similar to those of the Derive project. One work of theirs that clearly expressed this was in the exhibition, and covered in their talk: Ready Played, pixellated documentation of kids in the Banlieues engaging in Parcour, moving through their local environment in ways it was never built to support; in one sense, making it their own by finding new ways of being in it. This 'gamefied' video comes complete with health bar and score and expressed their broader project, as described in their paper, very well. It stands as a valuable artefact for reference in any conversation where game and life might be related, especially with tactical outcomes in mind. Is play an empowered kind of action - a 'free action' - or just a way of approaching existing actions? How might the situation of all action as play change the way we approach living itself? What of our society do we risk when we bring play into life? Auriea Harvey & Michael Samyn of Tale of Tales presented their Realtime Manifesto on Sunday, which stirred up some good conversation. Their talk was delivered in an especially theatrical fashion, where line by line of the manifesto was read from each then the other. While speckled with humour, their manifesto is nonetheless quite serious, asserting ways of approaching and using realtime 3d technology so that it might be widely recognised as a powerful, positively influential, context for human expression. They are decidedly opposed to the avant-garde, frankly stating it has brought little to enriching human life in general. Instead they call for a need to use this new medium in ways that are informed by what they see to be the great contributions of literary and pictorial traditions made prior to the Rennaissance (if I understood this correctly). 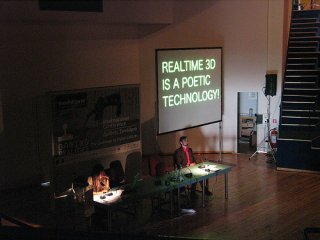 Their manifesto seems especially concerned with lifting the medium of realtime 3d away from what they see to be myopic artistic projects of self-referentiality and spiritually unrewarding non story-driven game-design models, touting it, as the picture below shows, as a "Poetic Medium". It was refreshing to be present at the premiere of a manifesto, but overall I found their push to be one driven by a fear of diversification, as though the medium itself would somehow fall from cultural importance through exploration of it's widest possible applications. It was also overtly concerned with what I see to be a simplistic, periodic and idealogically grounded construction of what constitutes 'beauty 'in the context of 'Art'. That said, I thought it was great to hear someone other than myself and Martin Pichlmair emphasise the importance of looking at the independence of the medium itself in any conversation of 'Independent game development'. The Tale of Tales people understand this very well and stand as a good yet rare example of putting-your-money-where-your-mouth-is. Despite my differences with parts of their talk, I always love a manifesto. I'll post this in the archives soon. This I liked, thinking of games as quasi-objects around which we group action and interest; entities which have lives and needs of their own. Maybe we should begin to see games not as vehicles for our experiences, but as systems that once propagated evidence their own desires to evolve. This is certainly the case with MMO's which while begun with a seed game design, are often manipulated over the course of time as play-models and technology prove themselves to be good or bad in the context of use. 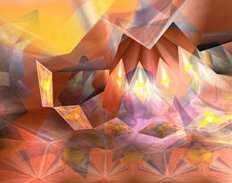 The game is also not something exclusively contained in the media-artifact either, it is expressed through action and so does, in a sense, 'live' outside the scope of its mere implementation. Of the artworks on show it was excellent to see the Eastwood Group's Civilization IV on display. 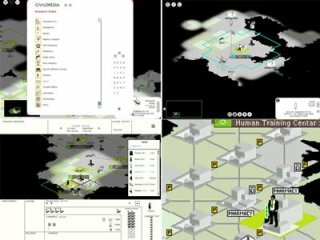 Civ IV is possibly the most ambitious and critically engaging political game ever made, and also undercover since a copyright dispute with Sid Meyer himself. Highly recommended playing: the luxury comes rarely since the copyright dispute. More here. Another standout piece was Sylvia Eckermann's Nowhere currently on show at the 3rd International Digital Art Festival, Changzhou in China. It was particularly refreshing to see a game engine (in this case Unreal2004) being used as a 'surface' for the production of pictorial content. While movement occurs in 3 dimensions, the 'space' in the work propagates as a sense of moment, rather than anything perceptibly explicit, moving instead through layered texture elements. Nice stuff - I'll write about this more when I put it in the archive. Finally, here's a copy of the paper I gave in my keynote entitled The Game is Not the Medium. It's available for non-commercial distribution and also features in the excellent conference proceedings. Hopefully Mediaterra will send me a link to a site where people can buy it as it's rare to see such a solid representation of crit theory on games between just two covers. A big thanks to the Mediaterra crew for a fine festival. Big thnx to Olli Leino for allowing me to publish the snaps of Eric and Tale of Tales.